If your a head hunter or HR recruitment staff, managing applicant's data can be tiring when your doing it manually. Filing printed CV and tracking each of them is nearly impossible when you don't have the right tool to help you. Simple Recruitment System is a free software you can use to manage a database of people who have applied for different jobs at your company. 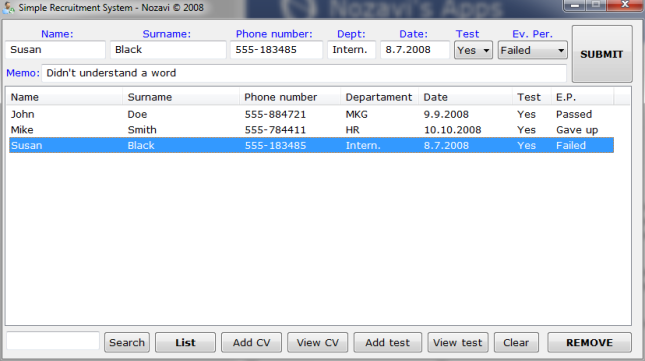 It accepts information such as Name, Surname, Phone, Department, Interview Date, Test, Evaluation Period and Memo. You can also add CV and test and view them in the near future. Simple Recruitment System works on Windows XP, Vista and Windows 7. Testing was done on Windows 7 Ultimate Edition. Recruitment Database is the need of the time. Since recruitment steps have gone to much complex and large number of students creeping in to work for in the market, the possibility of going through and checking all these have gone to a major time taking event, new recruitment software has also been introduced to deal with all these.